You hear a lot about how people watch films today, from the legit movie stream to the shady bit torrent - but for all the fancy tech, more films are watched live on TV than any other way in the UK. Live televisions broadcasts take a 20 per cent share of the UK's film viewing, with films recorded from the television coming in second with 14.5 per cent, according to figures released by the BFI in the UK Film Policy Review published by the Department for Culture, Media and Sport. 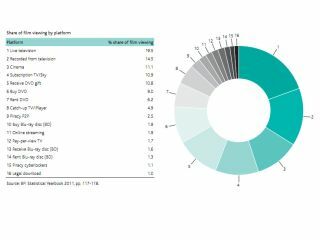 It may hearten the film industry to know that P2P sharing comes in ninth, taking only a 2.5 per cent share – but that's still more than legal online streaming which accounts for only 1.9 per cent of the UK's film watching ways. Worse by far, though, is the state of legal film downloading in the UK. Only 1 per cent of the country's share of film watching is done through legal downloads – that's 8 percent lower than bought DVDs. The DCMS report expects that improved broadband speeds will change all this, though, making it quicker and less painful to download films (legally of course). As well as highlighting differing viewing habits, the report reiterated the need to address online piracy, agreeing that 'pro-copyright education' and increased access to legal services are the way to go, rather than opting for heavy-handed site-blocking measures. The report recommends that a proposed research fund be put to use looking at "how different distribution models could affect levels of copyright infringement, including the impact of theatrical windows, on the release of independent films" - the outcome of this could see films reaching streaming and download services more quickly than they do now.